Hoping to buy a KR250 - what do I need to know? Having owned many, many 2Ts over the years, I have now set my sights on a KR250. Anything I need to be especially aware of when looking? I assume that bodywork is impossible to get hold of but are other parts readily available? Re: Hoping to buy a KR250 - what do I need to know? Hi there. Like you, I’ve had numerous 2 strokes over the years and now the happy owner of a 1984 KR250A1. I assume you are aware of Tim’s KR250.org site? Most of what you need to know (and a lot more) is all there. I have found it invaluable. The main trick for finding KR parts is to look for the equivalent parts on other Kwak models. I tend to look up the KR250 part on Tim’s on line parts catalogue, and then search internet, eBay (using worldwide search option) and Megazip to find the part. You are right about sourcing the more unique parts to the KR, particularly bodywork and engine parts. The Japanese auction sites have plenty of bodywork and parts (I use From Japan), and of course, most effective of all, is this forum! One of the great things is the worldwide enthusiasm for this rare and unique machine, so there is a strong ‘help each other out’ ethos across the forum. For example, I recently needed some replacement oil injection pipes, and via Tim, Ted Sagar, who races an impressively modified KR250 down in NZ, posted me a set that got to me in 4 days (big thanks again Ted), so shout if you need advice or parts. Of course, when it comes to checking one out to buy, look out for all the usual 2 stroke wear and tear issues. I tend to go for the most original and unmolested as possible as many strokes have short and violent lives being thrashed, crashed, raced and botched. 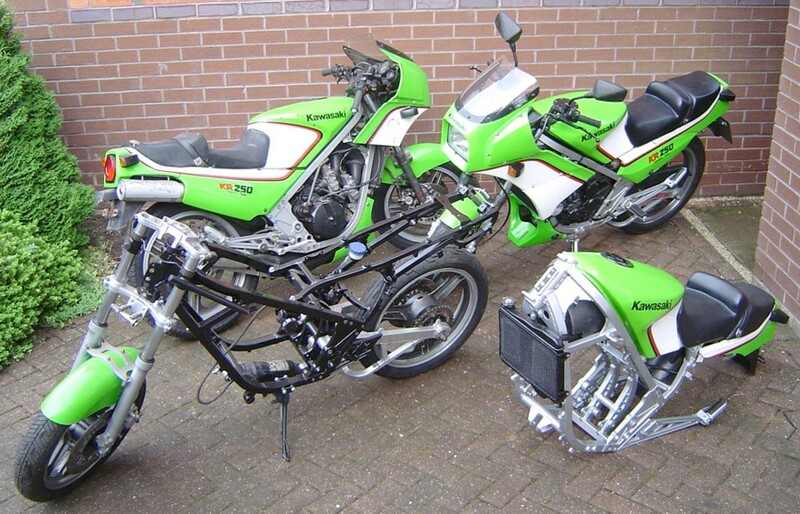 , which I like in the KR, the KR250 is up there with the best of the bleeding edge 2 strokes of the 80’s. Thanks for the replies - I have had a look around the KR250 site and it has been very useful. I'm pleased to hear that the KR community is there to help - but then again I found that when I had a KR1 and was an active member of the TDR forums for many years as well. Thanks for the kind comments about my KR250 site, I'm afraid that it's very stale these days as I have no free time for either keeping it up to date or totally reworking it (which is what it needs). But I'm very pleased that people still find it useful. I still get regular emails from new and existing KR owners (or would-be owners) and these days I tend to direct them straight to here - this is the best place to share information and parts. What do you need to know ? Well, they're quirky, over-complicated, occasionally temperamental and difficult to source parts for. I don't say that to put you off by the way ! But when you arrive at the pub on one, you're unlikely to see another and you'll get people asking what it is. There are not many KR owners around (compared to most of the other 80's 2-strokes) but in my experience they're all friendly, helpful and generous. We tend to hoover up spare parts whenever we can, but are usually willing to give them to others in need, 'cos we know that someday we'll need something ourselves and it's usually reciprocated. In fact, having a spare bike for parts is fairly common. I've had quite a few boxes of KR parts via Yahoo Auctions Japan, there's still a decent stash of used bodywork and other parts on there. Fuel tanks and pistons/rings are what I get asked about most, and they're both hard to find. Head-gaskets too, but all other gaskets are readily available via Gasket Guru and elsewhere. Surprisingly few parts are shared with any other model, but as Cexley says, get the part-numbers off my site and start googling. To ride, they're upright and narrow, they feel (and are) a generation older than a KR1/TZR/RGV, they're more like a Mk.1 Gamma. Unless you get an 'S' model, they're a bit flat at the bottom and then you get a huge kick up the arse at 6K. They sound like nothing else. You definitely want one ! The KR250 was originally sold new in Australia too, so you can usually find a selection of parts on Ebay Australia. I don't check regularly, but at times have seen a fairly large selection of bodywork, engine and chassis parts. Apart from being sold in Japan, the tandem twins were oficially imported in Australia, New Zealand and South Africa. Those countries are the best bets for parts (and perhaps complete bikes). Only a few made it to Europe as grey imports outside official Kawasaki channels. Australian bikes had a different rear mudguard and indicators to comply with laws out there, but otherwise are the same. Stop annoying me, I'm running out of space to hide the bodies! I’ve also read that the Oz KR’s were 48bhp, instead of stock jap 45bhp. I’m not sure how they gained the extra horses, but it would be useful to know as I don’t think they are ‘artificially, restricted to meet JDM rules. Never heard of differing power outputs. Even the 'S' is quoted at 45bhp, same as the normal one. Must be a typo, everything I've read about them quotes 45bhp. Where did you see the 48bhp quote? Hi All. It's stated in the S.A. and Oz Manuals. 35.3kw/48 BHP. I also watched an old Oz You Tube clip of an early 80's 250 Proddie race that the KR250's were dominating and they said the Oz bikes being used for the proddie racing had 48 bhp instead of the JDM 45bhp. I think it was mentioned in this clip. If not, I'll trawl through all the old KR250 clips on You Tube until I find it! Search ‘1984 250cc Production Motorcycle Race’ on YouTube. At the end of the race, they do a piece on the spec of the ‘new’ KR250 that is now dominaring 250 proddie racing. Again, they state the export example is 48bhp, as opposed to the JDM being 45bhp.